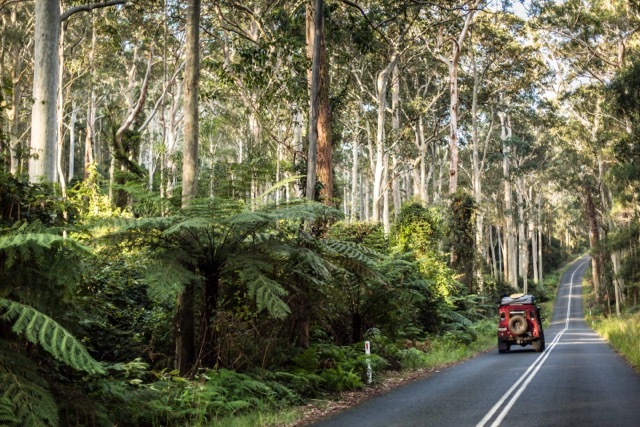 I always loved Summer growing up in the Blue Mountains (known to locals as the “Mowies”) West of Sydney – hiring a 4WD and heading out was always hand in hand with a sense of freedom; and as the Summer of 2003 came to a close this was no exception! I had graduated high school 4 months earlier and we all had that feeling that the world was ours for the taking – exams were done and we were never going back. I’d spent the summer working the days landscaping and the nights stacking shelves at the local supermarket saving every dollar I could to pack up and hit the road. I’d been dreaming about this day for years – it was finally the day to fly out; first stop was a return to Leone, a village in Samoa where I had gone to high school the previous Summer – and then onto the USA where the plan was to buy a car and drive from Los Angeles to New York – my first real road trip was on the cards! The Blue Mountains is a beautiful place not only to grow and to visit (it is one of Bear Rentals most travelled itineraries) and those 4 months were some of my favourite – but as the final years of school were coming to a close I would find myself laying in the front yard watching the 747’s fly West making way Asia and Europe day dreaming of when it would be me on that plane. March 21st finally rocked around – I probably couldn’t have been more excited albeit a little hung over – I boarded my flight to Pago Pago, American Samoa by way of Auckland and Apia. Although I had been thinking of this trip for years – I neglected to plan my first night on the road; I arrived in Apia late in the evening with my connecting flight to Pago Pago not until early the following morning – not thinking about the fact that flights between the Samoa’s go from a separate airport that is little more than a runway and a tin roof (literally a roof with a single light bulb and no walls); telling the airport transfer service that I was going to the second airport I drew some quizzical glances and repeated questions of “are you sure?”. So as it was I found myself hunkering down with my head on my rucksack under that tin roof engulfed in the warm tropical air – it had begun – and to this day I remember writing the first entry in a travel journal my brother had bought me for Christmas “If I get through tonight, I know I will be alright”. Admittedly this is not how I had foreseen my adventure beginning. Fast forward a few weeks and I was travelling by any means possible to get to Mammoth Mountain to meet a friend from school – after getting up to Yosemite and finding out the road through was snowed out and wouldn’t be open again until Spring; I had to hitch a ride back to Sacramento to make my way to Reno where I would have to wait two days for a bus to the mountain. If you’ve never been to Reno; just think of an older seedier version of Las Vegas – it’s pretty hard to fill two days when gambling isn’t your thing! None the less after 6 days I finally made it from San Fran to Mammoth Mountain – and more importantly after a few cold Budweiser’s I convinced my mate Ross that buying a car for around $1,000 and driving to New York was not only achievable but also an excellent idea! After years of dreaming; it was getting real; all we had to do now was buy a car – this was pretty monumental to me as this was actually the first car I had ever purchased! One week later we were the owners of a 1984 Ford Crown Victoria – a V8 5.0L petrol guzzling yank tank! Optimistically we named her the Manhattan Cruiser. The beauty of road tripping in a car like this was it had two bench seats which gave us enough room to curl up and sleep – one in the front and one in the back – not quite the same as sleeping in one of our pop top Defenders that’s for sure; but it would do the trick. We stocked up on cheap supplies from Walmart and jumped on the 10 and headed West to the great unknown (which would not have been unknown if we actually did a little bit of planning but at 18 and carefree planning wasn’t our forte). The first few days were going along swimmingly – until Rosco went and jinxed us that is. I’m not superstitious, but I never like to say something WILL happen when there are a multitude of things that can go wrong. Ross and I had been having a conversation about jinxes earlier in the day – he was staunch in his view that simply saying something WILL happen wouldn’t affect the outcome – whereas I have always preferred to err on the side of caution and say “should happen”. Splitting hairs to some but as fate would have it – Ross came around to my way of thinking 12 hours later. The famous last words occurred on the Northern side of the Zion National Park; we had picked up a couple of hitchers on the Southern side of the park a few hours earlier. We’d been driving with the for a few hours before we dropped them at their camp ground; upon saying our goodbye’s they ask “where are you heading?”. “We should be in Denver by tonight” I replied; “should” being the key word. “Whatever man, we will get there!” Ross turned and responded; “will” being the key word. Continuing our journey along the 70 Westward towards the snowcapped peaks of Colorado the sun had set on the horizon and we snaked along the winding road in the buffeting tailwind of a semitrailer. As the road straighten out and a train bridge passed overhead I pulled out to overtake the truck; and slowly we lost power and started to fall back behind the semi trailer. “My foot is on to the floor” I spat back, not really sure what had happened; then in its dying gasps the car spluttered and shook – the engine light flashed up on the dash; or as we referred to it later on “the you’re now f*cked light”. We rolled to the side of the road enveloped in darkness, 11 miles outside of Green River, Utah. I looked at Ross but I didn’t have to say a thing, he knew exactly what I was about to say. Safe to say my first road trip was not exactly going to plan – a couple of hours later we were towed into Green River. The Manhattan Cruiser was dead, the culprit – a $7 thermostat had jammed and caused the engine to fry. We sold the car for scrap metal for just enough cash to pay the towing and two bus tickets to Newark New Jersey. Three days later and 3 separate buses we arrived in downtown Newark with our hopes in hand – to add insult to injury; our luggage didn’t! The first leg of my adventure hadn’t gone to plan plan so much of that first adventure on the open road stuck with me and I knew that a road-tripping was the best way to travel. It was after the Manhattan Cruiser that I named one of our first Bears: Manny Two in memory of my first adventure mobile; the Manhattan Cruiser – thankfully Manny has managed to cover a few more miles in her days as a Bear.